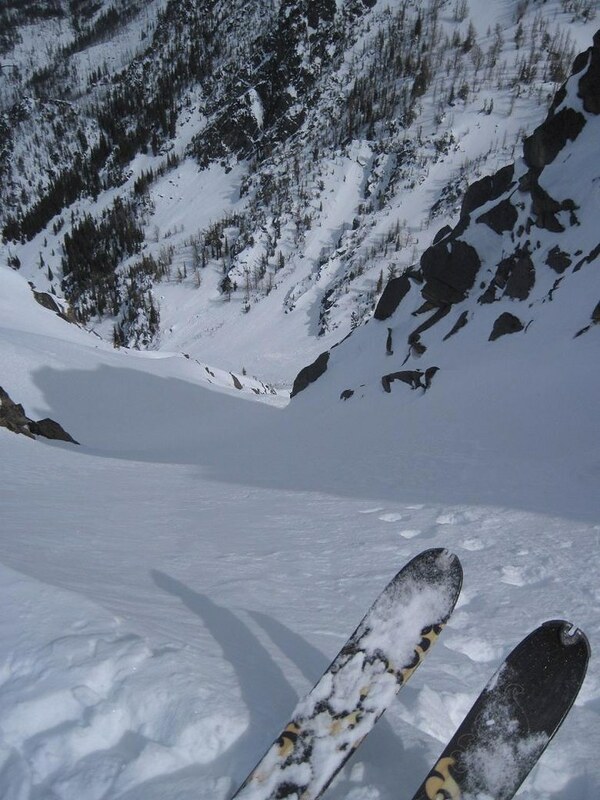 I've been thinking about this descent for a while.� Three years ago, Tom Janisch, Ian from Spokane and I tried booting straight up this face only to be thwarted by the rock band 2/3 of the way up the couloir.� This year, the couloir/face looked to be more filled in.� Despite this, I decided to just approach from the backside to avoid having to do a 1/2 pitch of mixed climbing and all the extra gear that step would entail. 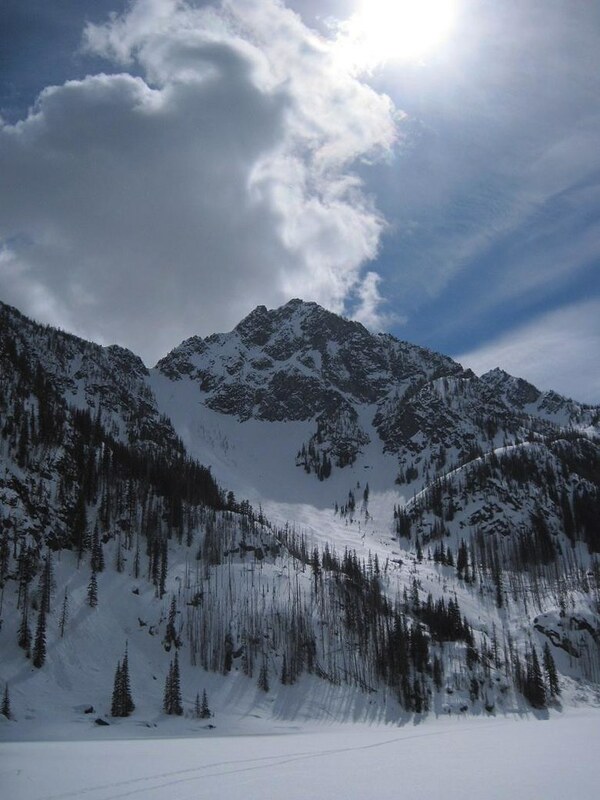 Axis Peak sits just above Eightmile Lake, with the NE Couloir/Face shown in the first photo below.� Axis is striking from the North, with steep ridges and multiple steep couloirs.� Looking at it from the South (Stuart side), it is barely distinguishable as a low-angle, treed slope that blends in to a ridge. 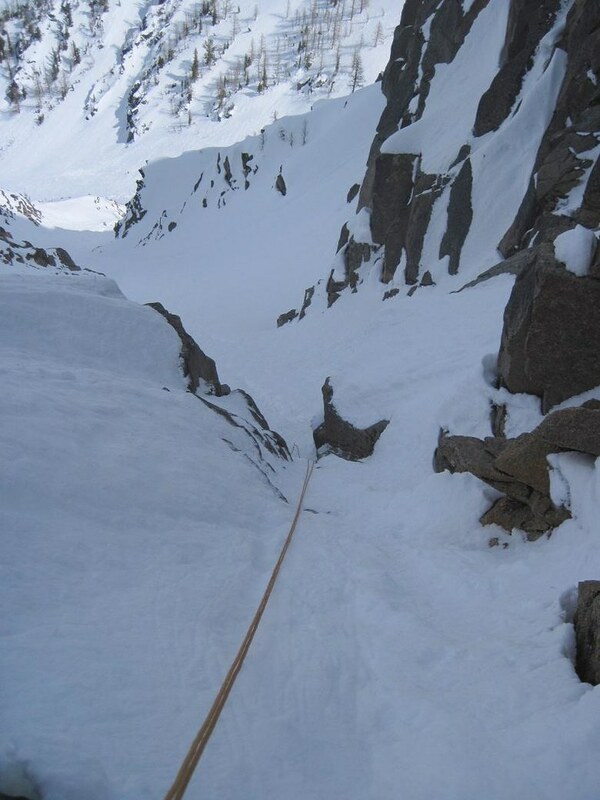 The top of the couloir. The small cliff band. If you look closely, you can barely see Kyle standing down at the bottom. 8 Mile Rd. 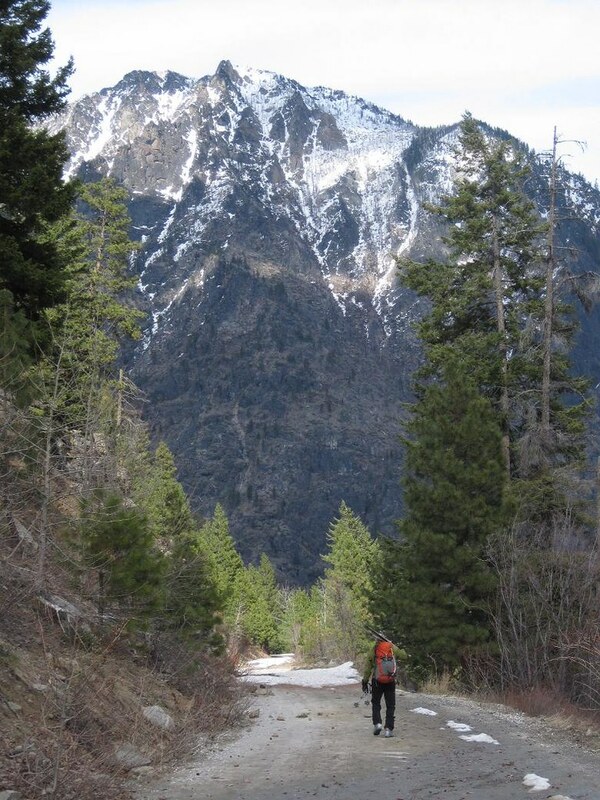 is melting out quickly.� Expect to walk from Bridgecreek C.G. to the steep grade sign where the road flattens out, which is at roughly 1.75 mile mark(?). Nice John. It doesn't look as exposed to the skiers left as I thought. Thanks Leland. Most of the objective danger you can't see until you're right above it. It's a fun line. In better snow it would be outstanding. Nice photo of Kyle in front Stuart's Northside. Glad you guys didn't try role reversal again. Kyle would have had to air his way out of that one. Thanks Scott! At least now I'll quit bugging you to ski this one, eh? Thanks Ryan. Hope you got your fill of red and green chili in Taos. It's high time we start working our way to Prusik Peak. This looks awesome! The broad slope to the lake is on my short list now. Thanks for the great report.